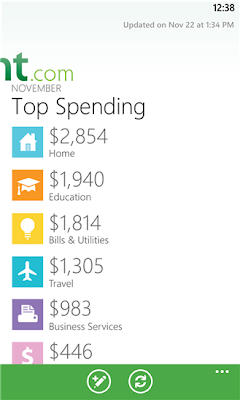 Mint app for Windows Phone 8 and Windows 8.1 pulls in all your personal finance accounts into one place, so you can manage your money from anywhere. Track your spending, create a budget, and save more. You can manage your budget with easy to use personal finance tools and calculators. Track spending and monitor your online banking account. It's easy to understand what's going on with your money. Up-to-date account information is easily accessed on Windows Phones, tablets, laptops and PCs. Transactions are automatically categorized to simplify money management, giving users the ability to organize their finances and create customized budgets. Mint suggests easy-to-follow steps to save more money based on user's spending. Enter or edit pending transactions. Add transactions at the time of purchase and instantly see available bank and credit balances.